Presentation of a proposed parking facility on the site. I also enjoy that the meeting is at 8am on a day after a holiday so no members of the public will be inclined to show up. This is basically a done deal as far as the State is concerned, the Commission could I suppose rule that this is unacceptable and deny it, but the State says the Commission has no power over them. The Commission, through the City, would have to sue to prove they do have the power. The previous City administration was unwilling to do that. If one wanted to express one’s displeasure about this, one should probably contact the new State administration. The new Director of the Department of Administration is Michael DiBiase, the phone number there is: (401) 222-2000. Governor Raimondo’s office can be reached through an online contact form or (401) 222-2080. Your comments would be in reference to Capital Center Parcel 15. 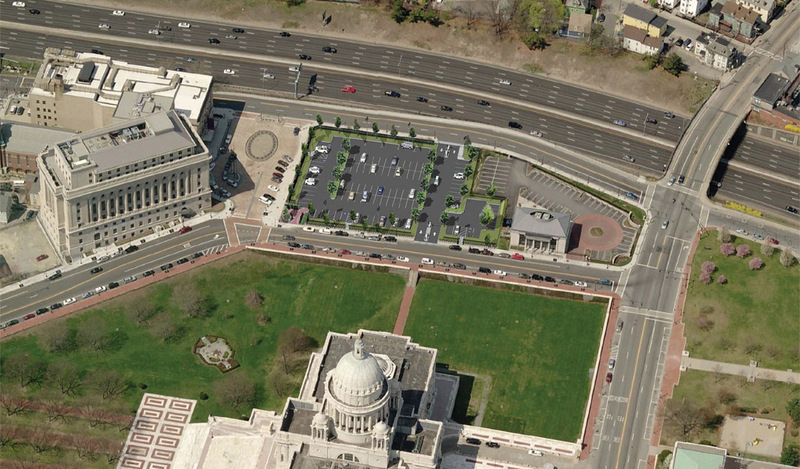 The Statehouse grounds are not symmetrically disposed relative to the axis of Francis Street. Making the East side match the west would free up valuable developable land and buffer the Statehouse from the train. It would provide for a much needed bus interface and allow parking to be removed from the Statehouse grounds. Has this been proposed? why has this kind of thing not been studied. If needed underground parking could also be incorporated. Seems like such a no-brainer. 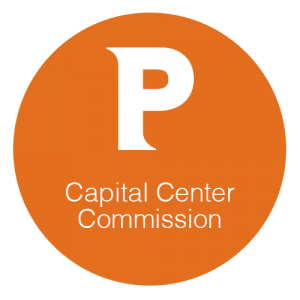 If the meeting with the Cap Center Commish is a formality then perhaps it would be good to let the Mayor’s office know that you’d like them to take legal action if this project goes on against the ruling of the CCC. While the new administration will learn quickly to pick its battles, it seems that if they know that people feel passionate about this, perhaps this is a battle they will pick. I think the underlying problem is that the state provides “free” (that is subsidized) parking for all its employees, (even at URI-Providence in the very city center) and provides no incentive to do anything other than drive alone. Rhode Map opponents note – this is despite the adopted State Guide Plan that has long called for the state to “lead by example” and encourage transit use (so anti-Rhodemappers need not worry about anything in the Guide Plan) AND a 2008 state law (enshrined in RIGL 36-6-21.1 that sets a goal of a 35% reduction in state employee commuting miles, calls for the offer of a transit pass in lieu of parking, and an annual report from DOA to the Governor and legislature on progress. No such report has been filed nor any such transit pass offerred though the Statewide Planning Progam, under some pressure from transit advocates and environmentalists, does have a study of the situation in their FY2015 work plan. Usually folks say the state doesn’t offer a transit benefit because they don’t have the money, though money is no limiting factor for parking expansion – nor is historical preservation judging by thr paving over of some of the State House green space. Its a disappointment that the Chafee administration went backwards on all this – they didn’t even arrange for a State House area bus shelter despite several direct requests. Let’s face it, parking demand is always over exaggerated in car centric cites. I don’t want to get political but the political influence of the big oil and car companies is a big factor in America’s car centricity. Confirmed with DPD that this parking lot is a done deal. Basically, the state gave a big 1 finger salute CCC, saying they do not concede that the city has any jurisdiction over the development of the property. All they could do was make suggestions on design. Translation, the state is your daddy, now STFU and let us grown ups do our business. This is the height of arrogance and it’s disgusting. Someone in the city needs to grow a pair and file legal papers.